Associated General Contractors of Minnesota is a non-profit professional trade association that is dedicated to promoting opportunity and excellence in the building and highway construction industry throughout the State of Minnesota. 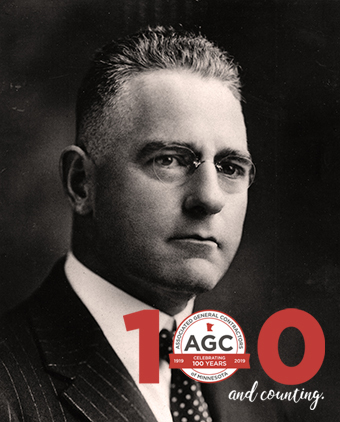 Formed in 1919, AGC of Minnesota was the first recognized chapter of the Associated General Contractors of America. Our members believe that skill, responsibility and integrity are fundamental values that contribute to their success. Under a strategic plan adopted by the Board of Directors and membership, the association focuses on the highway and building sectors of the market including heavy and municipal utility construction. Members include General Contractors, Specialty Contractors, and Affiliated businesses that have a vested interest in these industries. AGC of Minnesota operates as a centralized point of focus for information dissemination, education and training, and for leadership on important industry related issues. It also provides leadership to promote and maintain a favorable business climate for its members. To promote the health and sustainability of Minnesota’s construction industry through professional leadership and advocacy. Don Fegles served as AGC of Minnesota (then known as Northwest Area Chapter) board chairman in 1924. Don Fegles also held the distinction of serving as AGC of America national director. The visionary words Don Fegles imparted to our membership on the eve of the 1927 AGC of America convention, help to illustrate the importance of a strong and committed organization of individuals. This ultimately leads to a greater ability to transcend and succeed on unimaginable levels over the course of 100 years.